Brussels has its fair share of ice-cream parlours. And while the thought of ice-creams in Italy make you salivate even at the mere mention, there are a few ice-cream shops in the Belgian capital which are worth trying given they take their ice-cream very seriously. Some, like the Comus & Gasterea are even worthy of a trip to the centre just for the sake of trying new flavours. 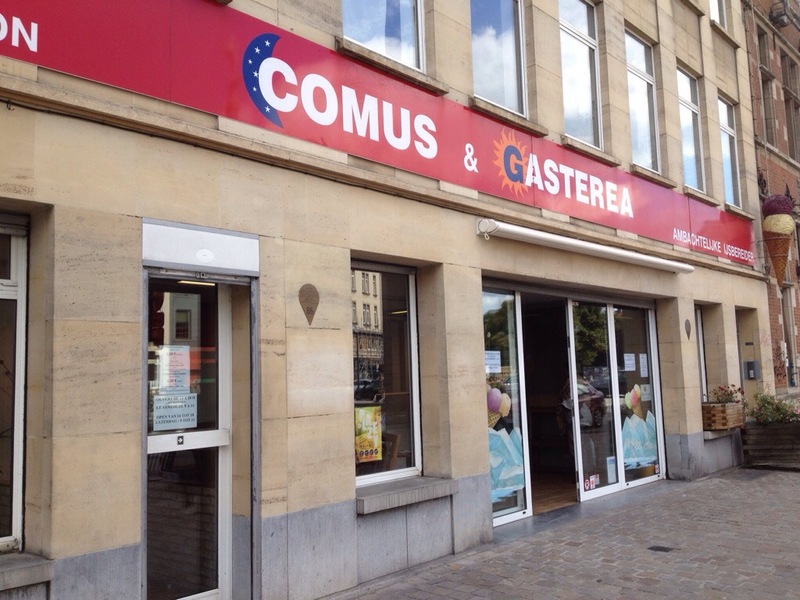 When we went for the first time to Comus & Gasterea I was trying to convince the children that they could try some exotic ice-creams like aubergine, basil, carrot, mustard or olive oil ice-cream. The eldest (5 years old) was tempted even though he still has a love hate relationship with vegetables. Nevertheless, on the day we visited there were no exotic flavours. Instead what he had were 8 different ice-creams including chocolate, speculoos, lemon, ‘roasted coffee’, salted caramel, cassis, strawberries and vanilla. The ice-cream maker is part of the Slow Food movement and there is no question as to why this is the case. He only uses products which are in season and only if he is convinced that they are good enough to make great ice-creams. This is the kind of place you will want to return every so often to see what is in season and what tickles the fancy of Michel, the ice-cream artisanal maker. We tried the vanilla, strawberry, cassis, salted caramel and ‘roasted coffee’. All were excellent but the best was probably the salted carmel. This was easily the best ever salted caramel I have ever tasted. At a price per scoop of ice-cream (Eur 1.50) which is probably cheaper than some of the more commercial ice-creams, this is really worth a visit. You will find this ice-cream shop just off Place St. Catherine on the Quai aux Briques. My second favourite ice-cream place is a tiny shop on Rue Bailli in Chatelain called Framboisier Dore. The ice-creams and sorbets here all burst with flavour. I particularly like the sorbets with seasonal fruits as well as the more traditional chocolate and speculoos flavours. Two other ice-cream shops have become institutions in their own right. 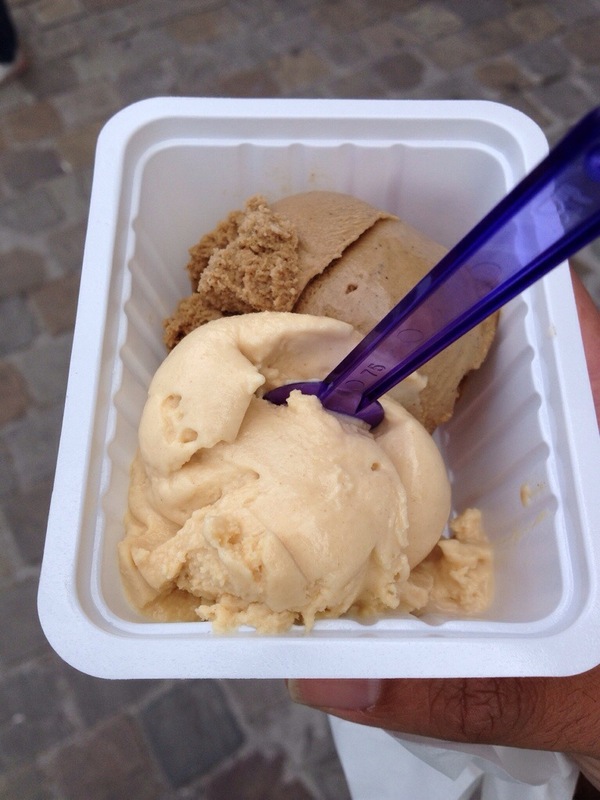 In Uccle, on Rue Vanderkindere on the side of Avenue Brugmann you will find Il Gelato and Glacier Zizi. It is difficult to choose which of these two is the best. Both are excellent in their own right and are within 100 metres of each other. Go there on a nice summer evening you are bound to wait in a very long queue as hundreds of people flock to this neighbourhood specifically to try these ice-creams. The fifth on the list but just as good as the previous two is Capoue which can be found in various neighbourhoods in Brussels. If you are lucky, you may come across the occasional flavours which are really worth trying. You can find Capoue also in the Bois de la Cambre which makes it another great reason to visit this park in the summer months. So if you are in Brussels in any of these neighbourhoods in the coming weeks try one of these places. And why not, take a detour if necessary. Sometimes it will be worth your while. Bravo Ivan. Provato Il Gelato, veramente squisito!!! Garanzia ivanbrincat.com!